Exercise and health diet can keep off excess weight, which can prevent or at least delay diabetes. Health.com -- Nearly 24 million Americans have diabetes; another 57 million have prediabetes, a precursor to the disease. In fact, the Centers for Disease Control and Prevention estimates that if the diabetes epidemic continues, one in three Americans will develop it in his or her lifetime. That's especially bad news for women, because the disease can affect both mother and child during pregnancy, and women with diabetes are more likely to have a heart attack (and at a younger age) than women without diabetes. Along with the worries about diabetes, there's a lot of misinformation (like skinny girls can't get the disease, or eating too much candy causes it), which is why we've gathered expert answers to the most common questions. 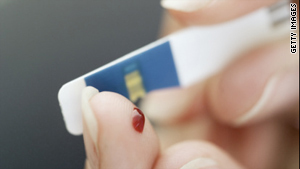 Type 1 diabetes is an autoimmune disease that destroys insulin-producing cells in the pancreas. It's most often diagnosed in patients under 18, but it can strike at any age. Type 1 diabetics need insulin to manage the disease. In type 2 diabetes, the body loses its sensitivity to insulin, the hormone that helps muscles absorb and use blood sugar. Traditionally, type 2 diabetes was diagnosed in older people. But with the rise in obesity, it's now being diagnosed at younger ages, sometimes even in children. Some traditionally thin populations are also being diagnosed with the disease as well. Type 2 is generally treated with changes to diet and exercise habits, as well as oral medication or insulin. Diabetes may cause no symptoms at all, but some signs include frequent thirst and hunger, having to urinate more than usual, losing weight without trying to, fatigue, and crankiness. If you're concerned, get your blood-glucose level checked, says Deborah Fillman, a registered dietitian and the incoming president of the American Association of Diabetes Educators. A fasting blood-sugar test measures the amount of sugar in your blood after not eating for at least eight hours. Normal is 99 mg/dL or below. Prediabetes is 100 to 125, and diabetes is 126 and above. Yes. Having a family member with diabetes raises your risk of developing type 1 by about 5 percent and type 2 diabetes by more than 30 percent. I've read that belly fat is a diabetes risk factor. Should I worry about my muffin top? Yes. Excess fat around your midsection is linked to a higher risk of type 2 diabetes. (Type 1 diabetes has nothing to do with obesity). In particular, the visceral fat wrapped around your internal organs can pose a problem, and it increases insulin resistance (the problem in type 2 diabetes) more so than fat in other parts of your body. Being obese or overweight in general can hike your risk of type 2 diabetes by more than 90 times. Why? Overweight bodies may just be too big for their pancreases to keep up, says researcher Dr. John Buse, director of the University of North Carolina Chapel Hill Diabetes Care Center. Can diet or exercise really prevent diabetes? Yes, exercising and eating a healthy diet helps you keep off excess weight, which can prevent or at least delay diabetes. If you already have diabetes, doing aerobic exercise and resistance training helps by encouraging the muscles to take up more blood sugar. Health.com: Can I drink alcohol with diabetes? Over the short term, it may even reduce the amount of blood-sugar-lowering medication you need to take. Long term, exercise helps lower the risk of complications like blindness and nerve and kidney damage by helping you better manage blood-sugar levels. On the diet front, a recent study found that type 2 diabetics who ate a Mediterranean diet, which is rich in fish, fruits, nuts, and olive oil, lost more weight and went longer without blood-sugar-lowering medication than those on a low-fat diet. Could my sweet tooth lead to diabetes? One of the oldest myths about diabetes is that sugar -- or a sweet tooth -- causes the disease. Says Riva Greenberg, a patient advocate and the author of 50 Diabetes Myths That Can Ruin Your Life, "A lot of people still think you get diabetes from eating too much candy." Not true. Nor is it necessary for diabetics to avoid all sugar. Eating a well-balanced diet rich in whole grains, protein, veggies, and fruit -- and low in fat, cholesterol, and simple sugars (which cause blood sugar to spike) -- is a healthy plan for everybody. I'm skinny, so I can't get diabetes, right? Being overweight is a major risk factor for type 2 diabetes, but 20 percent of people who get it are slim. "The number of type 2 diabetics is growing, especially in thin Asian populations," Greenberg says. Asian populations have higher concentrations of visceral fat, which may be a contributing factor, Buse explains. If I had gestational diabetes that went away, should I worry? Unfortunately, your risk of developing type 2 diabetes after gestational diabetes increases substantially -- between 20 percent and 50 percent. (Gestational diabetes occurs when hormones that help a baby's placenta develop interfere with the mother's insulin, resulting in higher blood sugars. It occurs in about 4 percent of U.S. pregnancies each year.) Your personal odds depend upon other factors like ethnicity, genetics, and weight. Losing weight after you've had a baby can help limit your risk.